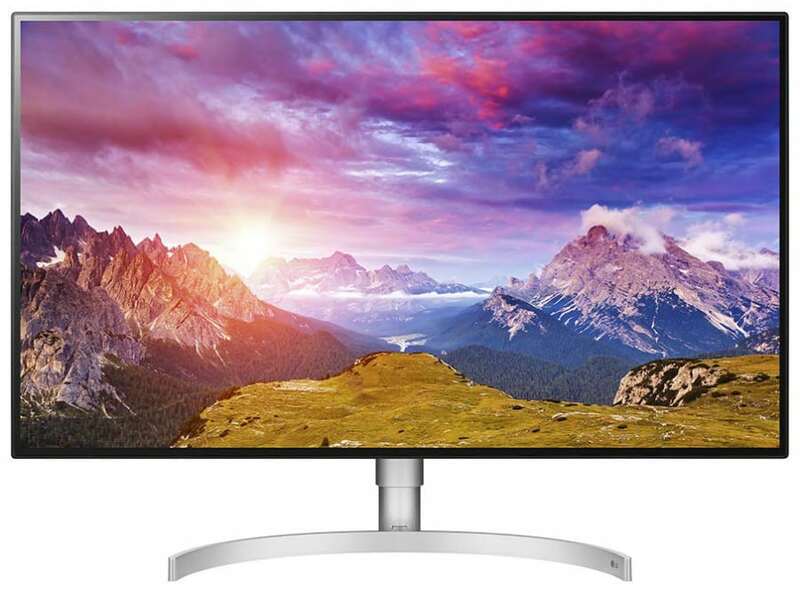 The LG 32UL950 modernizes the brand’s UltraFine portfolio with an improved Nano IPS screen and Thunderbolt 3 technology which maximizes the potential of USB-C connectivity. The model promises excellent suitability for professional applications, while its VESA DisplayHDR takes care of the entertainment side of things. The LG 32UL950 is a desirable option in today’s mixed-use prosumer market, but is it worth its premium price? The LG 32UL950 doesn’t offer anything new in the aesthetic department since it still utilizes the same design as last year’s models. That isn’t necessarily a bad thing since the formula works quite well for consumers which have a taste for minimalist or contemporary appearances. The first thing we love about this treatment is it gives the monitors sleek proportions that help them fit into tighter configurations. The monitor’s cabinet sports a white finish that is matched with a metallic silver stand for that luxurious appeal. However, the white plastic material does not extend to the face of the monitor since it is bezel-free for the most part. Black panel borders are still present, but they are almost nonexistent against the massive, 32-inch diagonal of the LG 32UL950. Functionality isn’t an issue for the LG 32UL950 since it is packed with the essential features you can expect from an upper-tier product. The device drops clunky OSD buttons in favor of a six-axis joystick which helps ease the woes of browsing through a packed settings menu. The included stand allows tilt, pivot, and height adjustments so users can easily attain the perfect view angle. You can also remove the mechanism to reveal 100 x 100 VESA mounts at the rear panel. Most users won’t consider this feature, but it is handy especially since the LG 32UL950 is well-suited for flush mounting or multi-display setups. But what’s most impressive about the LG 32UL950 is its connectivity layout which includes the latest and the greatest. 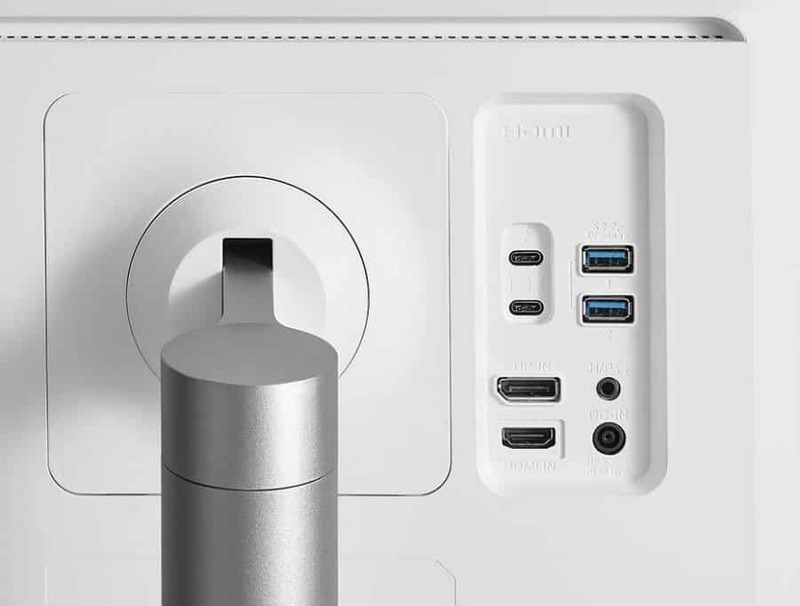 You will find a DisplayPort 1.4 and HDMI 2.0 slot for video inputs and two USB-C Thunderbolt 3 connectors for single cable operation or daisy-chaining two 32UL950s. The downside is the charging limit which is limited to 60W as opposed to the 85-Watt specs on most competitors. 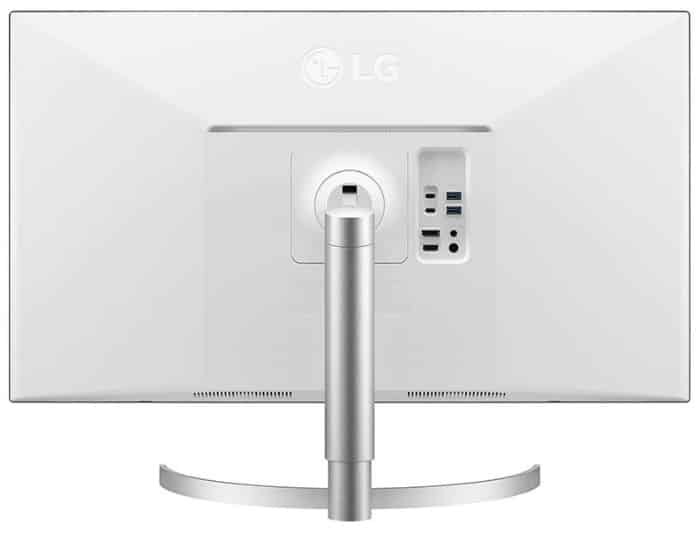 You also get a USB 3.0 layout and a 3.5mm jack with the LG 32UL950’s connectivity for peripherals or mobile devices. LG also managed to squeeze in a pair of 5-Watt speakers into the thin chassis, although they are only suited for basic audio such as background music when you are working on the display. Overall, the LG 32UL950’s build quality and refinement is excellent since the device is free from uneven gaps or seams. The whole package weighs in at only 16 lbs, but we did not feel that it was fragile or cheap when held. The only complaint we have is the slight wobble on the stand which is only disturbing if you accidentally hit the monitor or shake your desk. The LG 32UL950 boasts a 32-inch Nano IPS panel with a 3840 x 2160 resolution, 60Hz refresh rate, and 5ms response time. A contrast ratio of 1300:1 is specified, along with a 450cd/m2 backlight that falls short of the DisplayHDR600 spec. LG’s marketing, however, is keen on advertising extensive gamut coverage which is more or less accurate as proven by the previous Nano IPS monitors we reviewed. The first thing we can appreciate on this model is 4K’s perfect fit on a 32-inch screen which produces a sharp and well-detailed image that is balanced. Most users struggle with smaller 4K monitors when it comes to text or small objects since the pixel pitch is too dense. But that isn’t the case with the LG 32UL950, so most users wouldn’t need to rely on scaling to aid with visibility and intelligibility. A colorimeter test reveals that the LG 32UL950 isn’t as impressive as the brand’s other Nano IPS monitors since it falls short of a few specifications. The monitor is only able to reach 70% DCI-P3 or around 85% Adobe RGB coverage with loose color accuracy of around Delta E 3.6. The screen is slightly too warm for daily use, so calibration is necessary to get the most out of this device. Using a colorimeter like the DataColor Spyder Elite V can improve the color accuracy to Delta E .5 which is excellent even for photo or video editing. This treatment will also correct the color temperature to sit closer to the ideal 6500K while also improving Gamma. It takes a bit of effort to maximize the screen’s potential, indicating that out of the box users might have to consider other options for better results. The LG 32UL950’s peak brightness also falls a bit short since it can only hit a maximum of 445cd/m2 when HDR mode is active. This score drops to around 400cd/m2 for SDR content, enabling the screen to look vibrant despite usage in well-lit environments. It also helps that the backlight used in this model utilizes local dimming, making HDR-compatible titles such as Shadow of the Tomb Raider look more vibrant with deeper tones and detailed gradients. Another weakness we noticed is the LG 32UL950’s middling black level and uniformity, which is made visible when using the monitor in well-lit rooms. This issue is less noticeable when lights are off, but that severely limits the monitor’s potential for use in studios or offices. Gamers will be satisfied with the display’s output, but photo editors might have to check on the LG 32UD99 which is slightly better in some aspects. The LG 32UL950’s panel uniformity suffered as well due to some backlight bleeding on the edges. The monitor’s local dimming feature adds to the bleeding, making the monitor less attractive as an HDR solution. Take note that this could vary from unit to unit since no two IPS panels are created equal or perfect. What we love about the LG 32UL950 is its performance in gaming, since it can handle motion quite well despite the limited refresh rate. The monitor’s pixel transition time is agile enough to avoid irritating image retention or ghosting, although there are a few trails here and there. We think its forgivable due to the 60Hz refresh rate, so looking for something better will point you in the direction of either TN-based options or the super expensive 144Hz segment. The LG 32UL950 is also a FreeSync-based monitor, allowing AMD users to enjoy buttery-smooth greatness at 40Hz to 60Hz. The range is severely limited, but every frame counts when it comes to 4K gaming. We’re also pleased to report that this model works with Nvidia’s G-Sync initiative which makes the monitor’s Adaptive Sync function with Nvidia GPUs. It’s also pleasing to know that the LG 32UL950 clocks in at only 9ms, indicating that gamers will not suffer from delays caused by latency. The monitor is as agile as an E-Sports variant, with the 60Hz refresh acting as its main handicap. The LG 32UL950 offers excellent image quality and gaming performance, but its scores fall short of the manufacturer specifications and our expectations. Nano IPS monitors have been superb so far when it comes to accuracy and vibrancy, but this monitor somehow manages to drop behind its Nano IPS comrades. It’s a bit disappointing that the slower, yet more capable LG 32UD99 beats this newer variant in some critical aspects, such as gamut coverage and color representation. Don’t get us wrong; the LG 32UL950 is still a great solution for mixed-use or as an all-in-one display for your PC and 4K HDR consoles. But then again, the premium model doesn’t offer the optimal bang for your buck ratio since it is very expensive. Pricing will come down soon when supply and demands stabilize, but until then, the LG 32UD99 is still the better pick.